I take great pleasure in seeing people return to their active lifestyles after successful reconstruction. Dr. Watson is board certified by the American Board of Orthopaedic Surgery and board certified by the Royal College of Physicians and Surgeons of Canada. He is fellowship trained in Orthopedic Trauma and Adult Reconstruction and Arthritis Surgery. He received his Medical degree from Dalhousie University in Halifax, Nova Scotia, Canada. He performed his Orthopaedic Residency and Internship training at Queen’s University in Kingston, Ontario, Canada and completed his first fellowship training in Adult Reconstruction at Cornell University Hospital for Special Surgery in New York. He completed a second fellowship in Orthopaedic Trauma at Florida Orthopaedic Institute in Tampa, Florida. Dr. Watson cares for patients with severe musculoskeletal injuries, specializing in fracture related problems and pelvis and hip reconstructions. Dr. Watson is an assistant professor of orthopedics at the University of South Florida and a staff traumatologist with Orthopaedic Trauma Service, a division of Florida Orthopaedic Institute. He serves as a member of the Orthopaedic Trauma Association, Florida Medical Association, and the International Association of Orthopedic Surgeons. Dr. Watson took on my 82 year old mom after another physician tried to repair her broken hip. When we found that she had been trying rehab on a broken femur for two weeks, we knew we had to find another doctor. Dr. Watson was on call at TGH and was able to completely redo my mom’s hip for the second time in two weeks. My mom was a healthy active senior and Dr. Watson’s plan was to return her to that same lifestyle. He always greets us with a smile and a handshake. Well worth any wait in a busy office. Dr. Watson repaired and replaced my mother’s hip after another surgeon made a mess of it two weeks prior. The other surgeon said my mother may never walk again. Dr. Watson had her walking 12 hours after the second hip replacement. We can’t thank him enough. Would give 10 stars if I could. Dr. Watson is very personable, professional and thorough. He doesn’t hurry and listens to your concerns and responds appropriately. A very professional and easy to talk to Doctor. We love Dr. Watson! He always makes us comfortable when answering our questions and he listens to our concerns. His answers are straightforward and we trust his judgement. Dr. Watson is wonderful. I just hiked a path up to the top of Whiteface Mountain in NY to an elevation of 4867′ which never would have been possible without having a total hip replacement last February. He and his team are amazing. Thank you so much for giving me a new active lifestyle. I had a great experience with Dr. Watson and Stephanie. They both were very personable and courteous. My apprehension was calmed in a professional manner and the knee injection was painless. Dr. Watson is an excellent, caring surgeon. I was up and about very quickly following a total hip replacement with very few restrictions. This experience turned out to be less stressful and much easier than anticipated. We can easily see how important Claudia is to Dr. Watson and Florida Orthopaedic Institute. As busy as the office is, she always gets the patient name and information right. I called from the car on the way home from Alabama after a fall on my new knee. She was able to make me an appointment. A few days later, it was busy and she still had time for a hug. Dr. Watson is such a professional. While looking at my knee, he pointed out some swelling in both lower legs, and he suggested that I see my primary care doctor. I did a few days later and he is running some tests as Dr. Watson’s keen eye was right on the mark and knew something was not right. I’ve seen Dr. Watson a number of times and he is always comforting, tries all routes before surgery, and a great diagnostician. I’ll keep recommending FOI to my friends and family. Dr. Watson is a fine doctor and a fine gentleman. I feel confident with the way he examined and diagnosed my condition. I listened to all that he had to say then was able to ask my questions. 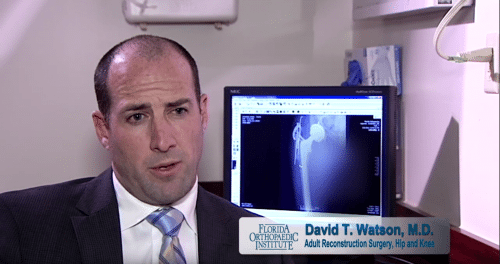 I surely recommend Dr. Watson and Florida Orthopaedic Institute. Thank you, Dr. Watson. I am on way to walking better thanks to Dr. David Watson and Florida Orthopedic Institute. I live in St. Petersburg, Florida and was seeing a physician here for a few months after a fall with two fractures in my left leg, one was a tibial plateau fracture. I also needed total knee replacement. I received 2 second opinions and the last physician referred me to FOI and Dr.Watson. At my first appointment they took X-Rays and I started getting set up for surgery. I am now a month away from surgery and doing great. In December of 2011, Dr Watson and I met by accident. I had fallen at work and ruptured the tendon that attached the hamstring to my pelvis. The hamstring had retracted into my upper leg, so Dr Watson performed surgery to reattach the hamstring to my pelvis. I would refer this man to anyone. I have no side affects and the leg is just a strong as before the accident. Five and a half months after the surgery I was back to work. I felt so good I even started to go the gym. Great job Dr. Watson and god bless you and your staff! Dr. Watson is the Best!!!!! I am a 54 yr old guy and I needed a total hip replacement. From the start I was at ease. It has been a year and I have never felt better. I referred a friend of mine to Dr. Watson and she had a knee replacement in September. You’re the best Dr. Dave and it is always nice to see that big smile; it lets us all know we are in good hands. Dr. Watson treated me in May 2013 for a right hip impingement with amazing results. I returned to Dr. Watson and had the left hip done in December of 2013. I have to say that Dr. Watson’s surgery and post operative care has given me my life back. I am a very active 46 year old female who plays golf, loves yard work and walking my dogs 3 miles a day and I now have NO PAIN and increased range of motion. Dr. Watson truly has a gift for helping people. Thank you so much Dr. Watson! Dr. Watson is amazing. He is a gifted surgeon. After two hip replacements and having the second dr. fracture my femur in multiple places Dr. Watson showed such concern for the mess I was left with. After blood work and a CT the picture was clear my last surgeon didn’t do the job. I actually had a bone sticking out on the X-Ray. The pain was unbelievable. Dr. Watson spent a lot of time with me and shared his concerns. CT showed it was much worse than I thought. Dr Watson did surgery in April. I do look like the bionic woman but he put me back together. Still have therapy and working hard to be able to walk again. I would never go to anyone else. This man is a trauma surgeon who fixed difficult cases. I am so grateful I found him. WOW The best doctor in the world,my hero.I was in a terrible hit and run ccident.Dr.Watson was able to save my leg and my arm.The arm was questionable,but Dr.Watson did it. My family and I give this credit to he lord and Dr.Watson. I will never be able to Thank you enought. Thanks again!